Siding & Windows Group is a proud supplier of Progressive Foam insulation products. We offer the following products: Pro-Board Premium, Fullback, Linebacker, Halfback, and Pro-Fold Insulation. ProBoard is made of Neopor from BASF, which contains high-purity graphite particles. The graphite reflects radiant heat, significantly improving insulation capability compared to EPS insulation, while giving it a dark gray color. 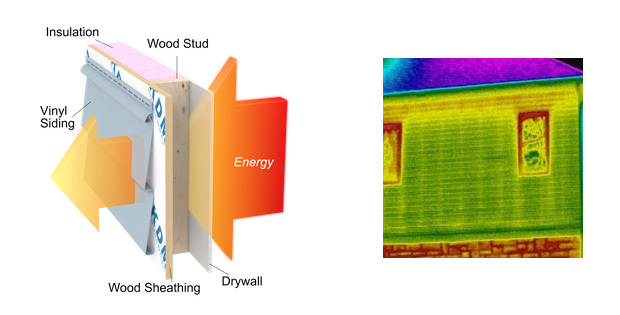 Thermal imaging reveals two energy leaks: yellow lines where energy escapes through studs, and red at the top of the wall where cavity insulation has settled over time. Thermal imaging reveals that thew all has turned a cool blue. Energy loss through studs and the top of the wall is no longer visible. Levels the wall under new siding, providing a consistent, stable base for siding to be installed smooth and straight. Deters termite infestation with a built-in termite control agent. Protected by a Lifetime Transferrable Warranty, one of the strongest in the industry, covering r-value retention, moisture absorption, and structural integrity. Whether you’re undergoing a new construction or an exterior remodeling project, InSoFast Insulation panels come with both constant insulation and superior architectural features ideal for any home project. InSoFast panels are designed to provide continuous insulation with a built-in attachment studs. 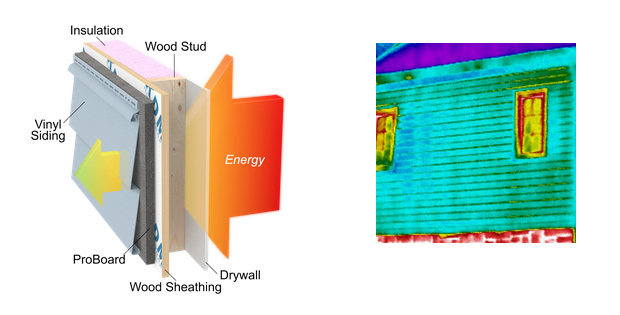 InSoFast’s R-10 continuous insulated sheathing panels are better durable alternative to the traditional wood framing and flat rigid foam insulation methods that are known to trap moisture. 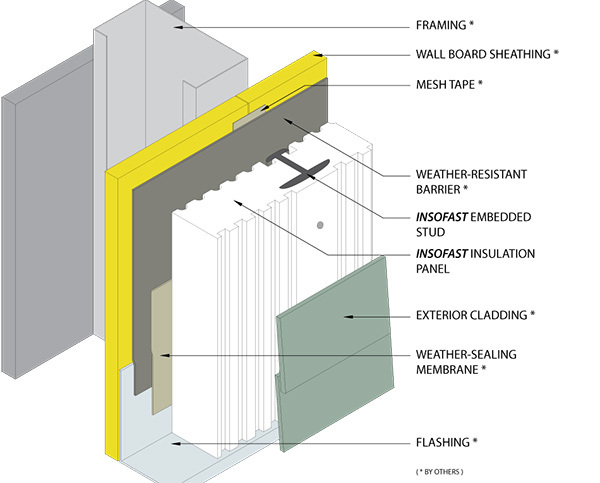 Because InSoFast’s insulation panels incorporate a 3 dimensional rain screen, drain and dry channels and integrates a fully insulated attachment stud for exterior finishes, InSoFast panels do not trap moisture in the wall assembly. What Does Continuous Insulation Mean For You? 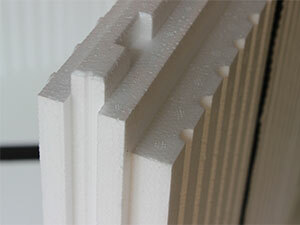 The closed-cell, injection molded polystyrene is a durable and reliable insulation. In fact, independent studies demonstrate that polystyrene retains its R-Value year-after-year, which means no thermal drifting. The embedded studs are fully insulated, and made from non-conductive copolymer plastic. Direct thermal transfer from the fasteners is reduced, and the studs are recessed by half an inch of insulation. InSoFast panels are designed with materials resistant to rotting, rusting, warping and decaying when exposed to moisture. Drainage planes are built-in on both front and back of the EX panel to simplify the multiple processes of the rain screen assembly. All four sides interlock and are designed with capillary breaks to prevent water from penetrating the insulation. InSoFast panels do not rely on building tapes for a perfect weather-tight seal. EX 2.5 is a continuous insulation weather screen assembly specifically engineered to be applied on exterior walls. This is only a part of the rain screen solution that provided maximum energy efficiency combined with superior moisture management properties. The properties of EX weather screening help support a building envelope in three important ways. The primary function is to be an insulation barrier. The second function is for protection against weather penetration. And lastly, it serves as a cladding attachment system to maintain thermal isolation. The options for exterior finishing can include cultured stone, stucco, tile, thin brick, metal panels and of course, the popular cement board siding, among others. Nail on panels and siding. Easy handling including cutting, attaching and getting it just right. Designed to use multiple complex processes in one panel. You don’t need a background in building to properly install. The application of InSoFast is not weather sensitive so it can be applied in most weather conditions. Siding & Windows Group is proud to specialize in this revolutionary home insulation product. We believe InSoFast insulation offers homeowners in Chicago an incredible advantage over traditional exterior insulation. Contact us today for more information or request your free exterior remodeling consultation.